Today we at Jetbolt would like to introduce the project that we've been working on for the last few months, a co-op Flash MMO called Grid12. In Grid12, you and lots of other players drive tanks, battling the enemies who've taken over the world. You collect loot, discover bases, unlock new tanks, build facilities and work together with your friends to reconquer the grid. Since our initial launch last August, we've enjoyed working with a terrific group of pre-alpha testers. These folks have really helped us out. Thank you! 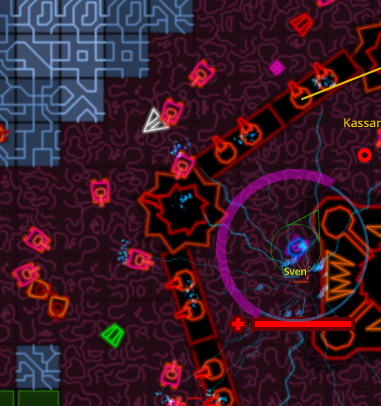 Grid12 now moves into its "closed alpha" testing phase. You are welcome to help us! If you would like to playtest the game, you'll need to get an invite code from an existing tester. Try asking for a code in the Grid12 forums. We hope to see you in the grid sometime soon! I'm heading to Austin this week for GDC Online, where I'll be a panelist at the all-day Game Dev Start-Up Summit on Tuesday. We are putting together the first batch of external testers for Jetbolt's co-op indie MMO project. If you are interested, please drop an email to testers@jetbolt.com. My previous project Realm of the Mad God was nominated in two categories at the 3rd Annual Game Developers Choice Online Awards: Best Online Game Design and Online Innovation. The winners will be announced at GDC Online in Austin this October. Aiming and firing a weapon are fundamental actions in most combat games. It's pretty much all you do in first person shooters. Certainly my previous project Realm of the Mad God relied heavily on aiming and shooting. 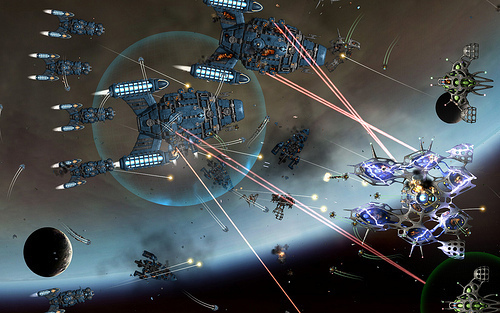 On the other extreme, Gratuitous Space Battles gives you no control at all, over anything! In my current project at Jetbolt, players have vehicular avatars: tanks and other heavily armed vehicles. Some of the tanks have forward-mounted guns, but other weapons may point to the sides or rear. Some weapons are turreted, rotating a full 360 degrees. 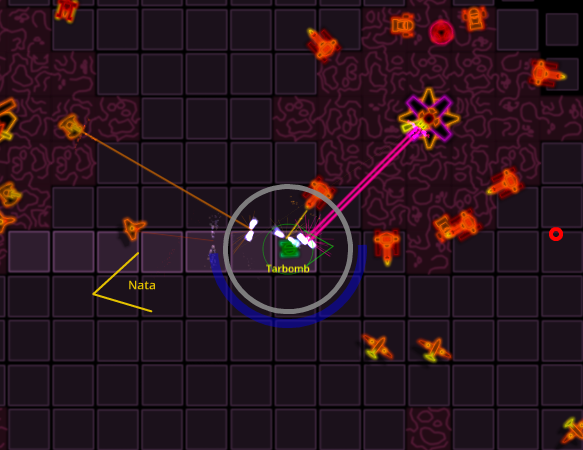 Some guns can hit only aerial targets, some can hit only ground-bound enemies, while others can target anything. There are single-target laser beams, area-affect shotgun sprays, delayed-blast mines and more. 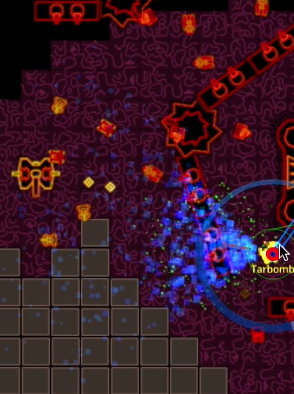 Although Jetbolt's MMO has plenty of guns and shooting, players can neither aim nor fire. We are striving for a mouse-only control scheme that lets players operate the game with one hand free. We'd also like the control scheme to scale up to big vehicles with 10, 20 or more guns. Rather than make the player control all of that, we're having the computer do the aiming and firing, while the player concentrates on positioning and orienting the vehicle, bringing the biggest guns and the thickest armor to bear on the situation at hand. There is risk in this approach: it may not work at all, or it may work but be unappealing to an audience used to aiming and shooting manually. But in some sense we have no choice but to try strange new things. Small indie projects can't compete with big-budget studios on quantity of 3D assets, dialogue voiceover coverage or cut-scene fidelity. Innovation is the only viable strategy for a small team in a field dominated by giants. So I hope it will work! 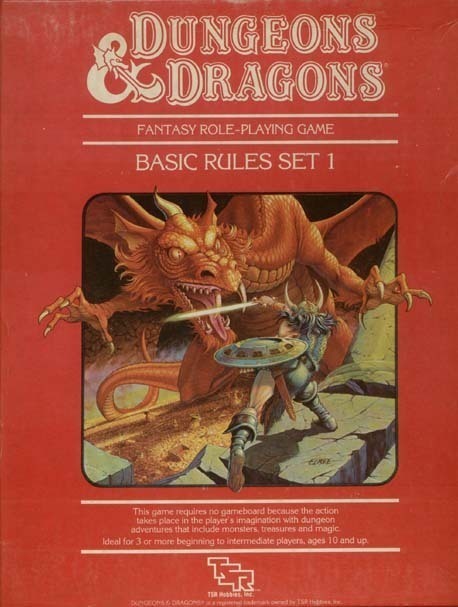 My introduction to role-playing games came from Dungeons and Dragons, the red box. Of course I was captivated. You could be a fighter, a magic-user, even an elf. What an awesome concept! A few years later, I played another pen-and-paper game called Champions. 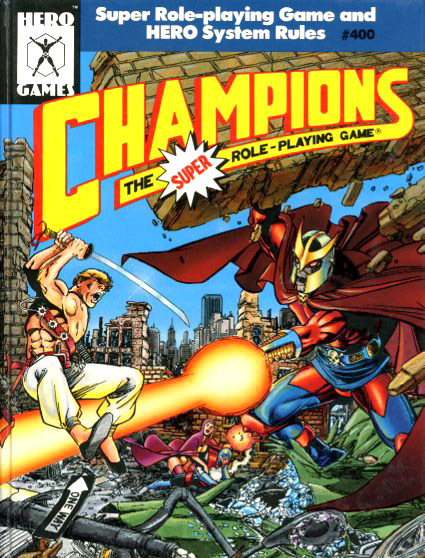 This was a superhero game, and the amazing thing about it was that you could be any kind of hero you wanted. There were no rigid character classes; instead, you bought your hero's abilities with character points. There seemed to be no limit to what type of character you could make. These days, most people experience role-playing games on a computer. But the old "fixed classes vs point-buy" debate still goes on. 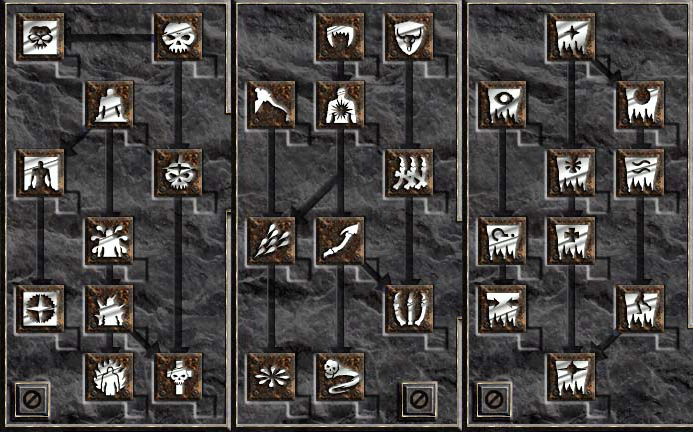 Some games make you pick from a menu of predefined classes, while others let you heavily customize your class through skill trees or even build your own class from scratch. Although the number of choices in a point buy system seems limitless, in reality, dedicated players quickly figure out which builds are the best ones. As these builds get published on wikis and message boards, the community converges on a very small set of viable character types. Meanwhile, newbies faced with a near-infinite set of choices shrug and just pick something, and that something tends to have sub-par effectiveness. With fixed classes, the game designers carefully curate the types of experiences that the players will have. Designers make each class unique, and they carefully balance them to achieve the target gameplay. By contrast, the designers of a point-buy system essentially leave the set of classes up to the vagaries of emergence. And so I think predefined classes are better. Earlier today, Kabam announced its acquisition of Wild Shadow Studios, the company Alex Carobus and I founded a few years ago. Wild Shadow's only real product was Realm of the Mad God, which started as a contest entry, but grew into so much more. Alex is a tremendously gifted and hard working engineer and a good friend, and I'm really glad that I got to spend so much time working with him on something that touched so many people's lives in a positive way. Congrats Alex!